When Apple quietly turned on carrier billing in iTunes in Germany last month, we said emerging markets could be the company’s biggest opportunity and target for the facility, which lets consumers charge things like app payments and music purchases to their mobile account instead of credit or debit cards. Now this looks like what Apple is doing. 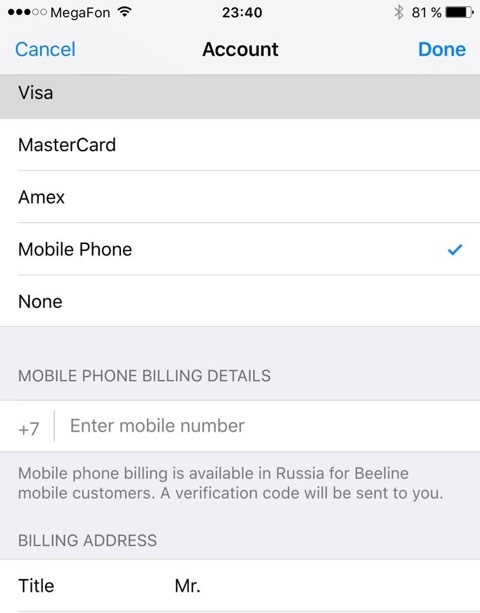 Yesterday, it was flagged to us that Beeline, a mobile carrier in Russia, quietly turned on the ability to make payments in iTunes through their billing system. You can look at how the options look in the screenshots, created in English, here. As you can see, in Russia you are given the option of linking up cards to your account, or you can link your mobile phone. Clicking on the mobile phone option offers the message that you can activate payments this way if you are a Beeline customer. This, in turn, will mean that you are either charged to your monthly bill, or payments are deducted from your topped-up, pay-as-you-go account. A source close to Boku has confirmed that the U.S.-based startup is providing the mechanics behind this as Apple’s partner. TechCrunch has confirmed that Boku is also the company working on the billing integration with O2 in Germany that debuted last month (we were not able to get a confirmation at the time from Boku, Apple or O2). We have contacted both Apple and VimpelCom, Beeline’s Amsterdam, Netherlands-based owner, for a statement on the service that is now live in Russia. Update: Beeline has officially confirmed in a release in Russian. But, as you can see in the screenshots, the service is live and plain enough to see, confirmation or not. Beeline and Russia are interesting firsts for Apple as it expands carrier billing to developing markets. Beeline is owned by VimpelCom, which is headquartered in Amsterdam and also owns carriers across other emerging markets, including Ukraine, Kazakhstan, Uzbekistan, Tajikistan, Armenia, Georgia, Kyrgyzstan, Cambodia, Laos, Algeria, Bangladesh, Pakistan, Burundi, Zimbabwe, Central African Republic. It also has operations in Canada, Italy and Greece. Tying up with VimpelCom in its biggest country is good foothold to test the service before rolling it out to other markets, which will be easier to do working with the same carrier. At the same time, Russia is a good first emerging market for Apple to roll out first, as it is essentially halfway between developed and developing. With a population of just under 144 million, Russia is considered the biggest Internet market in Europe, and as with other emerging markets a lot of new users are coming online by way of smartphones rather than fixed connections and larger computers. As we’ve written before, a phone enabled with carrier billing can essentially serve as a proxy for both cash and credit cards: mobile users can top up their phones with cash at shops, and those phones can then, by way of carrier billing, be used to pay for goods purchased on those devices, usually under a certain limit. Apps, music and books fall well within that limit. More specific to Russia, the country has had a problematic relationship when it comes to card services, recently having some international services cut off as part of a wider set of sanctions over Crimea, but being reinstated in a different non-U.S.-service-led arrangement this year. It’s therefore a perfect storm for Apple and carrier billing: countries like Russia represent a lot of growth for Apple, and so it’s creating a way to make it easier for consumers in these markets to pay to use the virtual services like apps and iTunes that make the iPhone so popular in the first place. Why so late to the game, you might ask? After all, carrier billing has been an option in most emerging markets on Android and other devices for years already. Apple is unlikely to answer that question directly, but my guess is that it has focused up to now on targeting early adopters and more well-off users in these markets. Now it’s widening out its approach and figuring out how to target the next tier of users to continue growing. It will be interesting to see if that is a strategy that could come through in other ways, too, such as lower-cost handsets.